Reflecting the CSW58 priority theme of “Challenges and achievements in the implementation of the Millennium Development Goals (MDGs) for women and girls,” over the coming months Ecumenical Women will be posting stories about our individual member organizations’ efforts to implement the MDGs. 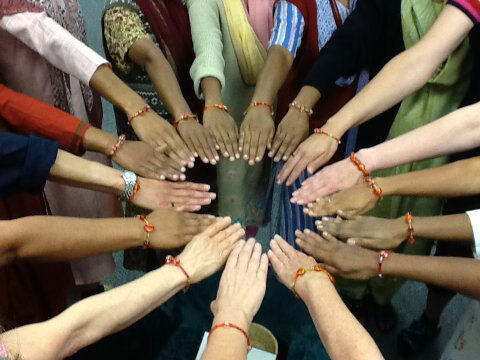 What follows is our fifth story, this one about how EW member organization Medical Mission Sisters works to help girls and women in India’s Dalit community organize for better education and greater freedom. This work directly relates to fulfilling MDG #2: Achieve Universal Primary Education. The story is from Smita Parmar. On November 24 three hundred and eighty three children gathered at Swabhiman Bhavan to celebrate the Children’s Day. They were of Dalit Community, (Dalits were formerly known as “untouchable”) They are economically weak, socially backward and politically voiceless. Prior to the celebration, we spent one and half months’ preparing the children with input as well as practice. Out of these 383 children 113 were from the Musahar (Rat eaters) community. We MMS and the staff focus on the development of the Musahar community. Education until today has not become a priority for them since allmost all the adults are illiterate. MMS have managed to get 23 girls below the age of eighteen years and admitted themin a residential school for Dalit girls run by the Government. Four girls have managed to reach up to 7th standard. It is very important for girls to stay in the hostel lest they will be married off since child marriage is highly prevalent. We conduct two coaching centers for those above six years in one of the three hamlets. It is difficult to get instructors from high castes to teach in Musahar hamlets. MMS stays in contact with the Musahar hamlets through Self Help Groups (S.H.Gs). There are seven active S.H.Gs of which six are women’s groups. One of our health workers goes around during the day to men (who work in the brick kilns) to get their wages or else the money will be spent for liquor and meat. It is with great hope that we were able to form one men’s group. Musahars, unskilled as they are, work as agricultural laborers. Paddy harvest provides them with the hay that keeps them warm during cold winter days besides the wage in kind they get. The rest of the year they work in the brick kilns. During rainy seasons, and in heavy winter, they quit the work and take out loans from the land / brick kiln owners. These loans are readily available as this is the trap by which these laborers can be turned in to bonded laborers. Our attempt to get them other jobs like security guards failed as they are not free to leave due to their indebtedness . We entered the Musahar hamlet about eight years ago. Women showed interest in saving the money and we could easily form a SHG . At one time one family could save a pregnant woman who had hepatitis, with the help of the entire money saved in the box. People are generous and cooperative when a matter of life was concerned. As the days went we noticed their box was often empty. Finally the group vanished. One and half years passed. One Musahar man was beaten up by a man of Dusad community. It was at this time MMS intervened to bring justice to the victim. The Dusad who was higher in caste was punished by the local court and had to pay a penalty to the victim. This was unbelievable and shocking for many. But the unimaginable event brought new courage and confidence to the Musahar community. When we put were about to put up a shed for the children’s coaching center, the land owner and his gang came and agitated over the matter. They were ready to file a police case against MMS. Missionaries are welcome to build a hospital, but not a shed for education; it could be made by the Government (which they know will not easily happen). The reality is if the Musahar children progressed in studies and got job, there will not be cheap labor available as the case is now. Even without the shed, classes went on and the children who attend daily coaching have proved their talents and leadership through a variety entertainments, speeches, etc. on 24th Nov. We continue to give hope to these insecure people and trust in God that one day they also will be able to live in freedom and dignity.